Founding father Keeree, with son Kavin, the CEO. Proof can be found everywhere the Skytrain glides overhead. Forests of high-rises sprout alongside, as developers pay hefty premiums for land near stations. “The premium for proximity to mass transit can be as high as 20% for projects within 200 meters of a station,” says Simon Landy, executive chairman of the Bangkok office of Colliers International, a property research and consulting firm. 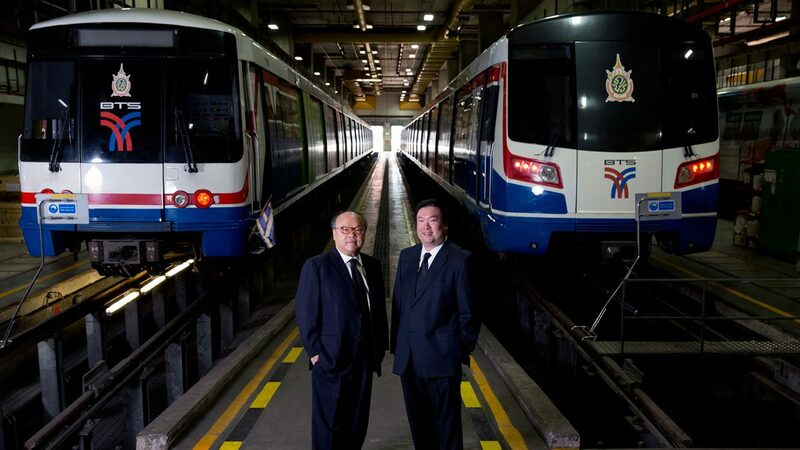 BTS is perfectly poised to capitalize as Bangkok massively expands its mass-transit system. In partnership with leading local developer Sansiri, BTS Group has five major residential real estate projects under way, all selling fast and all close to existing or upcoming mass-transit stations. BTS reported a record 61.7 million rides in its second-quarter results released last month, with fares totaling more than $50 million, up 7% from the previous year. Although lagging behind other Asian cities in mass transit–the Skytrain launched only at the end of 1999–Bangkok is catching up fast. Both BTS lines and the underground MRT (Metropolitan Rapid Transit) are rapidly expanding, and a handful of lengthy new lines will increase the overall network fivefold. BTS is in the thick of the bidding to build these new lines, says Kavin Kanjanapas, 41, Keeree’s son, who took over in April of last year as chief executive of BTS. In November BTS joined powerhouse Thai firms Sino-Thai Engineering & Construction Public Co. and Ratchaburi Electricity Generating Holding Public Co. to bid for nearly 70 kilometers of track on the new pink and yellow MRT lines. These are big projects, each likely to cost more than $1.3 billion. Yet they constitute a fraction of the cobweb of lines on Bangkok’s blackboard. BTS plans to bid on 138 kilometers of track to be built in the next five years, says Kavin. Win or lose, BTS is clearly in the driver’s seat, thanks to the foresight of Keeree, 66, who remains as chairman. 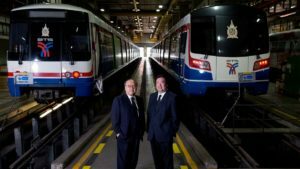 Few private companies anywhere can claim experience running mass-transit lines, but BTS also claims unrivaled expertise in operation, management and procurement, thanks to an unusual 30-year concession awarded the company in 1999. Back then building a subway seemed an unfathomable gamble. Indeed, others failed and Keeree nearly went bankrupt. But after making, then losing, his fortune, Keeree is now worth $1.45 billion, estimates FORBES ASIA. He’s poised for bumper profits as a front-runner in the expansion of the mass-transit system he kicked off two decades ago. On the mantle is a photo of the two, framing a freshly caught monster fish. They look like two pals on a holiday; both describe regular scuba and fishing trips together. But things weren’t always so jolly. Thailand’s economy was riding high two decades ago, until the Asian financial crisis in 1997. Economies across the region plummeted, but few hit the lows or felt long-term pain as severely as Thailand, where the crisis began. Even now Keeree struggles to explain the magnitude of his losses. Widely printed estimates have ranged upward of $1 billion, as debt soared with the tanking baht. “Oh, it’s more than that. Much more. I can’t really put an exact figure on it, but it was probably more like $4.5 billion,” he says, visibly pained by the memory. Keeree is the third son of Mongkol Kanjanapas, whose father immigrated to Thailand from southern China and began as a lowly merchant in Bangkok’s Chinatown. Mongkol moved to Hong Kong to find his fortune and ended up founding Stelux Holdings, selling Seiko watches. Eventually the business morphed into the ubiquitous City Chain, which has more than 400 watch stores in Hong Kong, China, Macau and Thailand. From watches Stelux moved into the eyeglass market, repeating its success with Optical 88 in Hong Kong and across Asia. Keeree was 13 when he arrived in Hong Kong, and he stayed for 30 years, making his own mark by founding the Seiko Sports Association and sponsoring a legendary soccer team that won seven consecutive league titles. Described by longtime associates as a relentless workaholic, Keeree parlayed his sports connections into a massive sportswear business via his Hwa Kay Thai Holdings, which became the exclusive distributor of Puma sportswear products in Hong Kong and China and eventually all of Asia outside Japan. While many in the Kanjanapas clan stayed in Hong Kong, Keeree and his older brother Anant looked to Thailand, where land was markedly cheaper than in Hong Kong. The pair built up massive land banks. Keeree formed Tanayong, Anant Bangkok Land, becoming intense competitors as two of Thailand’s largest developers. Anant’s Bangkok Land specialized in large suburban estates, notably Muang Thong Thani (Golden City), established in 1989 and planned as a self-contained satellite city for 150,000 residents, one of the world’s biggest residential projects at the time. Some liken the project to the massive building estates that skyrocketed in Hong Kong’s housing boom, entire cities of towers in the New Territories. Keeree unexpectedly found his focus–and his future–in a scheme with Hong Kong parallels. With local traffic grinding to a halt in the 1990s, Bangkok commissioned overhead toll roads, and subway systems like Hong Kong’s highly successful MTR (Mass Transit Railway). Three systems were put out to bid, and Tanayong won one concession. The others went to Bangkok Land and Hong Kong tycoon Gordon Wu’s Hopewell Holdings, although both bowed out long before Keeree launched his Skytrain. Forced to fend off banks and creditors while liquidating assets, he found a young ally: Kavin. Fresh from studies in the U.K., he returned to Asia in the midst of this financial tsunami. He was 23. Indeed, the Skytrain launched in late 1999. By then the government had stepped in to finish the first line of the MRT, which finally opened in 2004. Meanwhile, hundreds of concrete ghost pillars stretched across Bangkok for years as reminders of Wu’s ill-fated third subway project. Keeree’s trains were rolling, but he was left with a decimated business empire and unlikely prospects for a rapid resuscitation. With a small initial footprint, and lacking a connection to other lines, ridership remained low for years–around 200,000 a day, enough to cover costs but leaving nothing for expansion. But ridership has since almost quadrupled, and in a remarkable rebound BTS Group spun off its BTS Growth Infrastructure Fund, offering little more than a percentage of future fares as an enticement. It was Asia’s biggest listing in 2013 and the largest private sector IPO in Thai history, generating more than $2 billion. Media is one of four pillars of the BTS business, alongside the Skytrain, property and assorted services. Besides advertising in Skytrain stations, and on the inside and outside of trains, the media division includes large advertising screens in office building s and other locations around Bangkok, and the Rabbit smartcard. Modeled on Hong Kong’s Octopus card, Rabbit not only covers subway payments but is also a ticket to online services. Among its partnerships is a growing relationship with Line, the messaging service that started in South Korea and is dominant in Japan and Thailand. Anyone riding a subway train anywhere can see the potential of all those smartphones linked to smartcard accounts and messaging. Kavin describes some early experiments, like discounts at fast-food stores pinging passengers departing at stations. Rabbit can monitor not only the results of a coupon offer, but also future spending. And options will only grow as BTS adds more track and connected customers. Plus, it’s like fruit falling from the trees. BTS now has 3,752 employees, 57% in the subway division. Media has only 236 workers. “I just leave that to Kavin,” says Keeree, when pressed for insights on the online transformation of BTS. “Or I ask the children or grandchildren,” he chuckles. Media is also taking BTS to new horizons abroad. While the mass-transit division has investigated opportunities in China, as well as high-speed railway lines proposed for Thailand, media already has a JV with Titanium Compass to oversee advertising at 31 stations of Malaysia’s Mass Rapid Transit Corp., set to start service by the end of the month.